As promised here is another place I love in the old city of Istanbul – the Grand Bazaar. 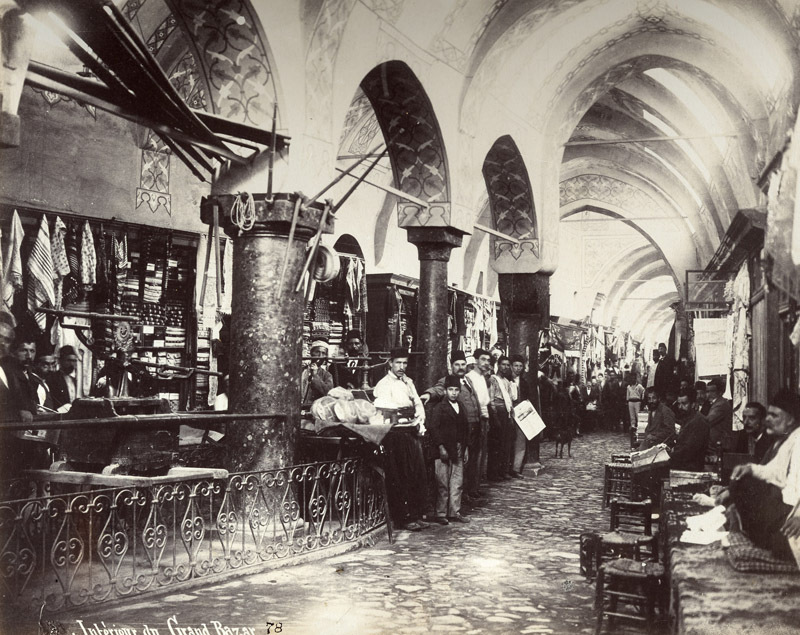 The interior of the Grand Bazaar in the 1890s, by Ottoman photographer Sébah. I love this place because it symbolises the essence of Istanbul: bright, colourful, noisy, confusing and utterly seductive. It is a place that is rich in history and beauty, plus having the honour of being the oldest and one of the most visited bazaars in the world. The bazaar in Istanbul’s historical Fatih district employs 25,000 people and features 64 avenues and streets, two “bedestens” (covered bazaars), 16 khans and 22 gates containing its 3,600 shops. You need a couple of hours at least to see the Grand Bazaar, to really get a sense of how large and wonderful this place truly is. It is also well worth heading out to the street and checking out the many other stalls. We discovered a wonderful cafe tucked away down a side street, which had been converted from an old hamam. It was a lovely quiet place to escape the activity outside. Keep an eye on your wallet. 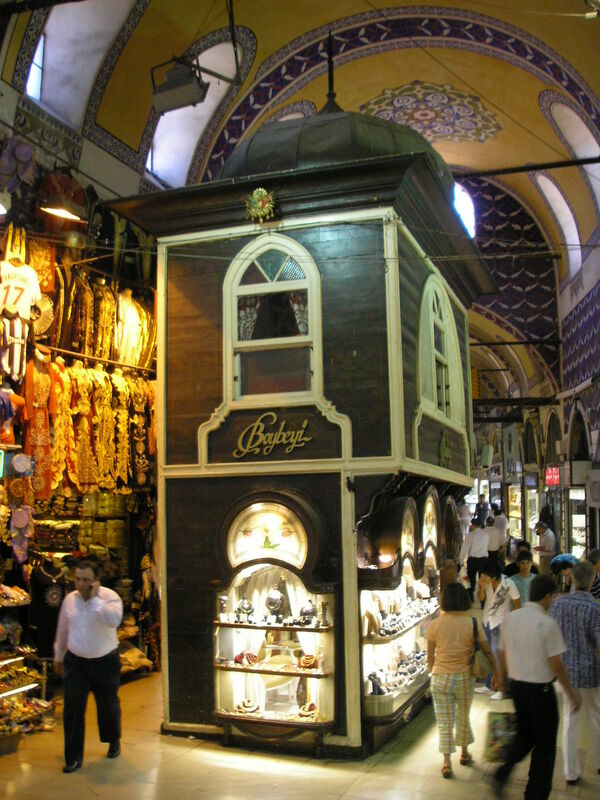 Istanbul is a relatively safe place, but crowded places like the Grand Bazaar are tempting for thieves. Don’t forget which gate you entered from – it is big and confusing inside and too easy to get lost (which is fine if that is your goal). Bargain, bargain, bargain. The prices are very inflated here so do a check of prices beforehand. My rule of thumb is paying 1/2 to a 1/3 of the asking price. Ultimately, if you really want something you won’t feel too bad if you get ripped of a bit. We also avoided the rug shops here, the apple tea is very tempting but I do not feel comfortable getting trapped in the store – the pressure is on for you to buy! There are also lots of copies of designer gear with varying levels of quality. I bought a beautiful fake Jimmy Choo bag, which I realised later was a copy, I didn’t care or realise as I am not one for brands, I just like what I like. Just be aware though that you are probably getting sold a fake. Most store holders we met told us when their stock was fake and would usually tell you what level of quality the copy was – #1, #2,#3, etc. Something to also be mindful of is that sometimes the bazaar is closed, Eid and also Turkish Republic Day are two days we noticed it was shut. Catch the tram to Çemberlitaş (the stop after Sultanahmet), go down Vezirhan Caddesi (you will see the Çemberlitaş Hamam on the corner) to the end of the street. You will see the Nuruosmaniye Mosque on the left and then the Bazaar is just behind the mosque. Have fun! I’ve been there and I LOVED it! I think the designer bags and stuff are always fake in these markets but varying levels of quality.